Mandalay Bay shooter Stephen Paddock may have been a high-roller, but he lost a slip-and-fall lawsuit against a Nevada casino in 2014 — and still owed $270 in court fees when he killed at least 59 people Sunday, including himself. 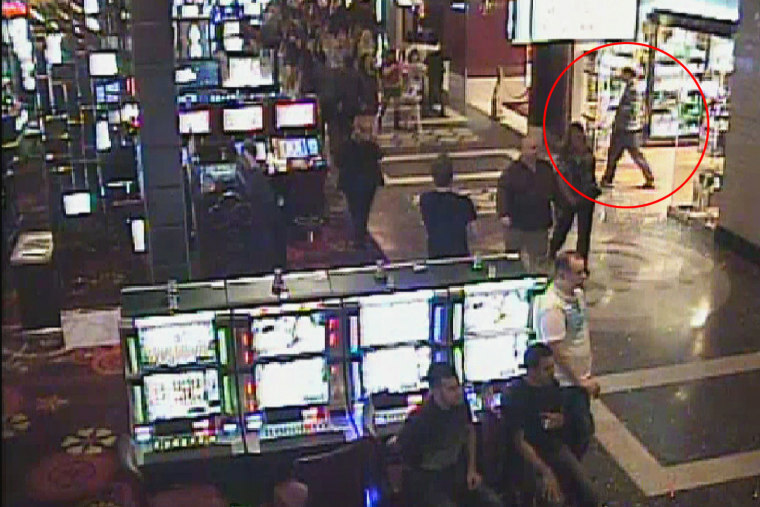 Security video from the Cosmopolitan Hotel shows Paddock slipping and falling on Oct. 30, 2011, as he walked from a hotel shop towards a high-stakes area in the casino. Paddock said he had slipped in a puddle of liquid and sued the hotel in 2012, initially asking for $100,000, according to the attorney for the hotel, Marty Kravitz. "They always ask for a lot more than they can get, but he got nothing," said Kravitz. Kravitz met Paddock when he testified in a deposition for the lawsuit. Paddock enjoyed a special high-roller status with perks at at least one Vegas casino, but Kravitz described the man he met as "unkempt," "slovenly and careless" and "bizarre." When Paddock fell at the hotel, said Kravitz, he "was wearing crappy flip-flops with a beverage in a bag in his hand." "You wonder what a guy like this is doing at the Cosmo." Kravitz also said, however, that there was "nothing about Paddock that would ever indicate someone who was unstable." "This is not a guy that I would have looked at and thought, 'He's going to commit a crime one day.'" The Cosmopolitan case was scheduled for a civil trial, but then went to arbitration in 2014. According to the arbitrator's decision, Paddock reported incurring more than in $32,000 in medical bills, and also wanted to be paid for pain and suffering. Security video shows him getting medical attention and then being stretchered out of the casino. "As a result of the fall," said the document, "Mr. Paddock allegedly sustained a tear to his hamstring as well as a sprain/strain injury to his wrist" and elevated blood pressure. The hotel maintained that Paddock had failed to prove negligence because "there was no actual or constructive notice of any liquid in the area of the sundry shop." The arbitrator confirmed that the video does show Paddock slipping and falling, but also noted a custodian can be seen passing the same spot about a minute before Paddock's accident, followed by about 20 hotel customers, and none of them "appear to have noticed anything on the floor [or] tried to avoid a wet area." The arbitrator also said that on page 48 of his deposition, Paddock indicated the lighting in the accident area was "great," but had testified at a hearing in the case that "there is no way you are going to see liquid on the floor." "Due to the totality of the evidence," ruled the arbitrator, "I therefore enter a decision in favor of the defendant." He also dismissed any allegations of negligence as "without merit." According to his brother Eric, Paddock was a millionaire, with real estate holdings in California. Caesar's Entertainment had granted him a "Seven Stars" designation as a frequent gambler "with status" at its casino properties, according to a source familiar with the investigation. Seven Stars is the highest level for high rollers, and is by invitation only. In the weeks prior to his death, according to multiple senior law enforcement officials and a casino executive, Paddock had gambled large sums of money at Vegas casinos. Currency transaction reports show that Paddock had recently gambled more than $10,000 a day, a source who has read the reports told NBC News.